If you're an avid reader, you've got to check out Goodreads. It's a great online tool that helps me keep track of what I'm reading, what I've read, and what I want to read. Your books can be organized into lists based on parameters that you set (which is how I know exactly what I read in 2009). You can also read and/or write book reviews which you can choose to post directly to your blog (or not). So, without further ado, here is my 2009 year in books along with a few opinions. I read a total of 35 books. Eighteen of them were completely my choice. I read 9 books for my online book club, Reader's Anonymous, and another 8 were young adult or school-related titles (since I teach young adults). Angels and Demons (Dan Brown) My favorite! The Red Tent (Anita Diamant) Suprisingly good! The Other Boelyn Girl (Phillipa Gregory) My favorite! Gregor the Overlander (Suzanne Collins) My favorite! Obviously, my favorite author is James Patterson. He almost never disappoints me. I also enjoy Robert Crais, Stephen White, and Janet Evanovich. For 2010, I will continue to read those four authors as well as other mystery/suspense novels (my favorite genre). I hope to include some nonfiction in 2010 as I only had one nonfiction title on my list for 2009. I'll continue to participate in Reader's Anonymous because I honestly read some terrific books I would not have chosen on my own. Feel free to join RA! And of course, I will read some young adult literature as it pertains to my teaching career. If you're interested in any of my reviews of these books, you can find me on Goodreads. Please join us for Sunday Scrappin'! Last week I made 26 digital scrapbook pages, printed them out, and put them in sleeves to go with the others I have made for my mom over the year. I started this last year by giving her a binder of our best photos from 2008 done in a digital format that I can print out for her. So, I decided it may as well become a tradition, and we are on year two. Since there were so many pages, instead of uploading them all individually here, I decided to put them in a slideshow so I wouldn't overload the loading of this page due to graphics. The topic for Heads or Tails this week is Show-n-Tell. Show something, then tell about it, just like in kindergarten. Vivit the home of Heads or Tails to see other players, to participate, or to see future themes. Here is a funnel cake. Here are my children ready to dig in to this yummy funnel cake. Here's a recipe for funnel cake. 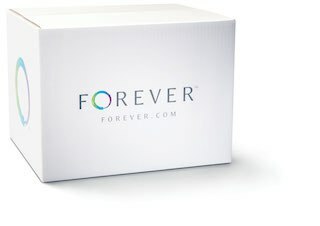 Here's a company that sells funnel cake mix. And here's a YouTube video showing how to make funnel cake. I received this beautiful batik from my bloggy friend Latree from Dandelion. I was so surprised! She made this and sent it to me all the way from Indonesia! Thank you so much, Latree! I love it! Here is an article on batik for anyone who is interested. Here's Lacy, who loves to climb the tree. Yes, she climbs the pole (we have an artificial tree this year), and she sits in the branches. Wish I had my camera ready for that one, but here she is under it instead. The tree is not fit for pictures after all of her climbing! Silly cat! I haven't done a menu plan in ages! Our schedules have been so crazy and hectic, but now that I have my temporary place for just the kids and me, I know who is going to be where and when and I can plan accordingly. Monday - Taco Salad - ground beef, lettuce, tomato, tortilla chips, grated cheese, and Catalina dressing tossed in a bowl, served with sour cream on the side. Tuesday - Crock Pot Chicken - chicken breasts, cream of mushroom soup, and chunks of peeled potatoes will simmer in the crock pot all day. We'll have a side of black-eyed peas, too. 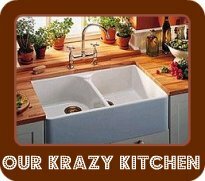 Wednesday - Pork Roast (pre-cooked) with gravy, four-cheese Rice-a-Roni, spinach, and French bread. Thursday - Eat Out! It's my turn to pick. Shall I choose seafood or steak? Friday - Beef and Cheese Enchiladas - Lawry's enchilada sauce, flour tortillas, ground beef, and shredded Mexican cheese blend. These don't even need a side dish! The winner is "Anonymous." Comment #11. Congratulations! Everyone's favorite monkey is back, and he's got a new movie! Curious George: A Very Monkey Christmas debuts on PBS December 6, 18, 19, 20, and 25. Check your local listings. Although I haven't seen the movie yet, I have heard the Soundtrack, and it's so upbeat! I love Christmas music (I'm one of those crazy people who could listen to it year-round! ), and I love the Jingle Bells song! You'll be dancing and singing to the music and getting in the holiday mood. The soundtrack follows the story line of the movie through song and music: George and The Man with The Yellow Hat are having a very merry time counting down the days until Christmas. There’s only one puzzle: neither of them can figure out what to give the other for a present. There are some new versions of holiday classics and some brand new songs you and your children are sure to love. 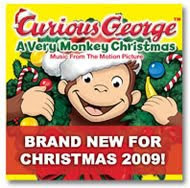 Denon has agreed to give one of my lucky readers the music soundtrack CD Curious George - A Very Monkey Christmas. To enter, simply leave a comment on this post before December 12 at midnight CST. Open to US residents only. Nonbloggers may enter, but please leave your email address so I may contact you if you win. Earn an extra entry for each of the following (you may choose to do them all). Please leave a separate comment (and link if necessary) for each extra entry. Thanks, and good luck! You're going to love our favorite monkey! "This post was written for Family Review Network as part of a program for Denon Records, who supplied the CD for review." What are your favorite Facebook applications? And don't forget to enter my candle giveaway tonight! December 13 is my four year blogging anniversary. I can't believe it! And... I am approaching the 1,000 posts mark. When all this began, I had no idea what blogging would come to mean to me. It's a very special place where I can participate in social memes, share my crafts, hone my writing skills, review products, vent about daily life, and host giveaways. Wait? Did I say giveaways! I'll be hosting a giveaway soon to mark my anniversary! Stay tuned. I love all of you out there in the blogosphere.